A tibial eminence fracture is a partial or complete fracture of the attachment of the anterior cruciate ligament (ACL), one of the four major ligaments of the knee. The ACL is a ropelike structure that helps keep the normal relationship of the femur (thigh bone) and the tibia (leg bone). This ligament is most important in sports that require pivoting, changing direction (cutting), or jumping and landing. In children the bony attachment of the ACL is more likely to break off (fracture) than the ligament is to tear (sprain). However, this ligament is often stretched in conjunction with the bone pulling off the leg bone (tibia). This is because the bony attachment connects to the leg bone via growth plate cartilage, which is weaker than the ligament. Associated injuries to the collateral ligaments (on either side of the knee) or the meniscus cartilage occur often with this injury. 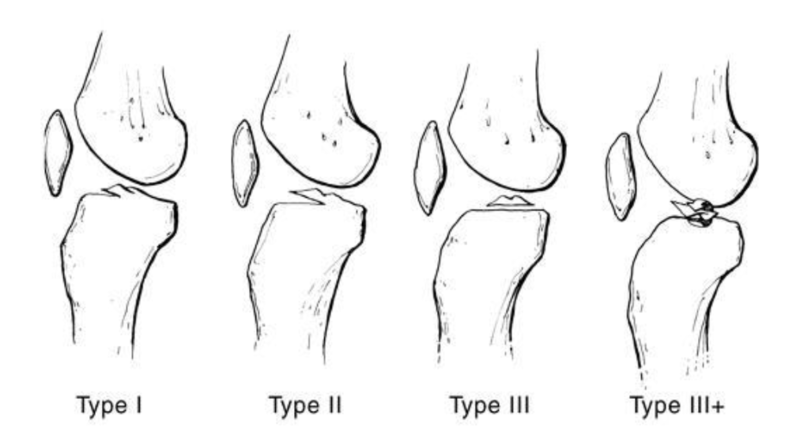 A tibial eminence fracture is caused by force that exceeds the strength of the growth plate. This injury may be as a result of a noncontact injury (landing awkwardly or cutting while cleats are stuck to the ground) or from contact, such as getting tackled at the knee. Appropriately warm up and stretch before practice and competition. Wear proper equipment (such as the correct length of cleats for the surface). The bone will usually heal with appropriate treatment, although residual knee looseness and giving way may occur, especially with sports that require pivoting, cutting, and jumping and landing. without the assistance of a physical therapist or athletic trainer. The sutures, wires, or screws usually do not need to be removed. Nonsteroidal anti-inflammatory medications, such as aspirin and ibuprofen (do not take within seven days before surgery), or other minor pain relievers, such as acetaminophen, are often recommended. Take these as directed by your physician. Contact your physician immediately if any bleeding, stomach upset, or signs of an allergic reaction occur. Your physician may prescribe stronger pain relievers as necessary. Use only as directed. Cold is used to relieve pain and reduce inflammation. Cold should be applied for 10 to 15 minutes every two to three hours for inflammation and pain and immediately after any activity that aggravates your symptoms. Use ice packs or an ice massage with a cloth between the ice and your skin to prevent burning /freezing your skin. Heat may be used before performing stretching and strengthening activities prescribed by your physician, physical therapist, or athletic trainer. Use a heat pack or a warm soak. A tibial eminence fracture is a partial or complete fracture of the attachment of the anterior cruciate ligament (ACL), one of the four major ligaments of the knee. The ACL is a ropelike structure that helps keep the normal relationship of the femur (thigh bone) and the tibia (leg bone). This ligament is most important in sports that require pivoting, changing direction (cutting), or jumping and landing. In children, the bony attachment of the ACL is more likely to break off (fracture) than in adults. However, this ligament is often stretched in conjunction with the bone pulling off the leg bone (tibia). Associated injuries to the collateral ligaments (on either side of the knee) or the meniscus cartilage can occur often with this injury.